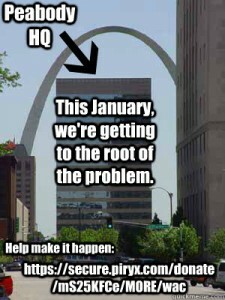 Winter Action Camp – in St.Louis – Starting Jan. 7, 2013 Apply Now! St. Louis is home to five coal companies (including Arch, Patriot and Peabody) agri-giant Monsanto and leading frack sand provider (Mississippi Sands)–just to name a few. As Arch attempts to destroy Blair Mountain, Patriot shirks paying thousands of retired miners’ pensions, Peabody continues to pollute water in Black Mesa, and so much more, their CEOs hide in St. Louis, far from most of the communities whose health, water and way of life they are destroying. MORE, RAMPS, BMIS and members of the Black Mesa/Big Mountain communities are coming together for the 1st urban Winter Action Camp in St. Louis as yet another part of the growing national uprising against economic and resource extraction. Build community organizing & direct action skills. Hold CEOs accountable. Grow a movement. Join the winter action camp. Apply here today. Can’t come? Please donate to help send impacted community members from Black Mesa and Appalachia to the Headquarters of the companies who are destroying their health, water and way of life! This entry was posted on Sunday, December 2nd, 2012 at 2:35 pm	and is filed under action, Arch Coal, Black Mesa, Blair Mountain, BMIS, Climate Change, Patriot, Peabody Energy, Solidarity, Uncategorized. You can follow any responses to this entry through the RSS 2.0 feed. You can leave a response, or trackback from your own site.